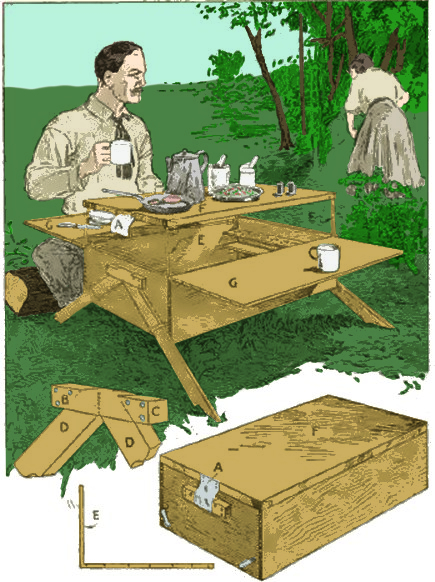 The combination camp-kitchen cabinet and table is the result of not being able to take the members of my family on an outing unless they could have some home conveniences on the trip, and perhaps the sketch and description may help solve the same problem for others. The table will accommodate four persons comfortably, and extra compartments may be added if desired. The cabinet, when closed, is strong and compact, and if well built with a snug fitting cover, is bug proof, and the contents will not be damaged even if drenched by rain or a mishap in a boat. For coffee, tea, sugar, salt, etc., use small containers. They are set in pocket shelves at both ends. When closed, one can sit on the box or even walk on it if necessary when in the boat. When open for use, the metal table top F is supported on metal straps, E, which also act as braces and supports for the table leaf, G, on each side of the box. This affords plenty of table surface and one can easily get at the contents of the cabinet while cooking or eating. The legs, D, are stored inside of the box when closed for traveling. They are held in place under metal straps when in use, and held at their upper ends by the metal plate and blocks, B and C. The bent metal pieces, A, on the ends of the top, spring over the blocks at B and C, and form the handles.